The big news in the world of maps has to be the publication of a book of Maps by Paula Scher, a partner at Pentagram. Whether she's charting New York or China or Israel, her work isn't about cartographical accuracy—but it's illuminating all the same. Words, in a sense, get you from here to there. The organization cultureNOW has created a compelling new mapping project called MuseumWithoutWalls, which highlights public artworks, notable spaces, cultural and civic institutions, and historic buildings. It's a great resource. Illustrator Christiane Engel is working on a series Postcards of the 50 States—having created 18 of them to date. New Jersey features Atlantic City, Jersey tomatoes, and Bruce Springsteen, which sounds about right. Missouri is below. 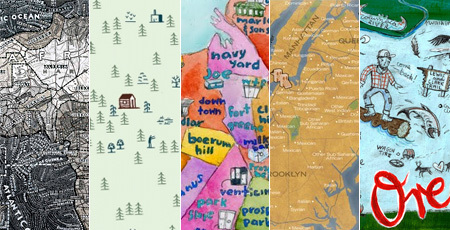 Irresistible: the artist Charrow's Specialty Coffee Map of Brooklyn. Impulse Records at 50, Jazz at Lincoln Center, October 28 and 29: When Impulse Records began in the early 1960s, John Coltrane was its most important artist. His bassist Reggie Workman honors Coltrane's legacy with his own African-American Legacy Project in a re-creation of the album Africa Brass. In the 1980s, Impulse sprang back to life and helped revive jazz. An important artist of the new Impulse era was pianist Eric Reed, who will open the concert, featuring the music of Impulse artists including Freddie Hubbard, Duke Ellington, Coltrane, and of course, Reed himself.